Noble Fir is a large evergreen tree typically up to 40–70 m (130–230 ft.) tall and 2 m (6.5 ft.) trunk diameter, rarely to 90 m (295 ft.) tall and 2.7 m (8.9 ft.) diameter, with a narrow conic crown. The bark on young trees is smooth and gray with resin blisters, becoming red-brown, rough and fissured on old trees. The leaves are needle-like, 1-3.5 cm long, glaucous blue-green above and below with strong stomatal bands, and a blunt to notched tip. They are arranged spirally on the shoot, but twisted slightly s-shaped to be upcurved above the shoot. 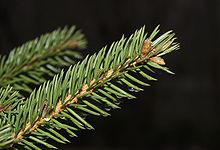 Fraser Fir is a small evergreen coniferous tree growing to between 30 and 50 feet (10–15 m) tall (rarely to 80 ft [25 m]) with a trunk 16 to 20 inches (40–50 cm) across (rarely up to 30 in, 75 cm). 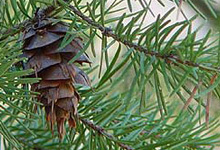 The crown is conical, with straight branches either horizontal or angled 40° upward from the trunk; it is dense when the tree is young, but becomes more open as it ages. The bark is thin and smooth, gray-brown with numerous resin blisters on young trees, becoming fissured and scaly with age. The foliage is strongly turpentine-scented. The leaves are needle-like, arranged spirally on the twigs but twisted at the base to spread in two rows; they are 0.4 to 0.9 inches (10–23 mm) long and 79 to 87 mils of an inch (2–2.2 mm) broad, flat and flexible with a rounded or slightly notched tip, dark green to glaucous green above, often with a small patch of stomata near the tip, and with two silvery white stomatal bands on the underside. 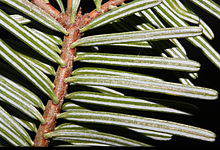 Nordmann Fir a large evergreen coniferous tree growing to 60 m tall and with a trunk diameter of up to 2 m. In the Western Caucasus Reserve, some specimens have been reported to be 78 m and even 85 m tall, the tallest trees in Europe. The leaves are needle-like, flattened, 1.8-3.5 cm long and 2 mm wide by 0.5 mm thick, glossy dark green above, and with two blue-white bands of stomata below. The tip of the leaf is usually blunt, often slightly notched at the tip, but can be pointed, particularly on strong-growing shoots on young trees. 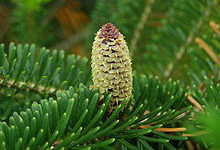 Green Spruce (Norway) is a large evergreen coniferous tree growing to 35-55 m (115–180 ft) tall and with a trunk diameter of up to 1-1.5 m. The shoots are orange-brown and glabrous (hairless). The leaves are needle-like, 12–24 mm long, quadrangular in cross-section (not flattened), and dark green on all four sides with inconspicuous stomatal lines. 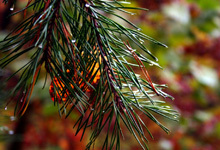 Balsam Fir is a small to medium-size evergreen tree typically 14–20 metres (46–66 ft) tall, rarely to 27 metres (89 ft) tall, with a narrow conic crown. The bark on young trees is smooth, grey, and with resin blisters (which tend to spray when ruptured), becoming rough and fissured or scaly on old trees. The leaves are flat needle-like, 15 to 30 millimetres (½–1 in) long, dark green above often with a small patch of stomata near the tip, and two white stomatal bands below, and a slightly notched tip. They are arranged spirally on the shoot, but with the leaf bases twisted to appear in two more-or-less horizontal rows. 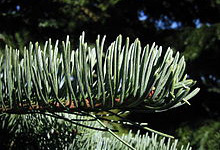 Grand Fir is a large evergreen coniferous tree growing to 40–70 m (exceptionally 80 m) tall and with a trunk diameter of up to 2 m. The leaves are needle-like, flattened, 3-6 cm long and 2 mm wide by 0.5 mm thick, glossy dark green above, and with two green-white bands of stomata below, and slightly notched at the tip. The leaf arrangement is spiral on the shoot, but with each leaf variably twisted at the base so they all lie in two more-or-less flat ranks on either side of the shoot. Different length leaves, but all lined up in a flat plane, is a useful way to quickly distinguish this species. 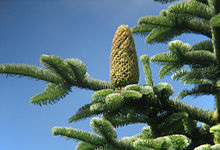 Douglas-firs are medium-size to extremely large evergreen trees, 20–120 metres (70–390 ft) tall (although only Coast Douglas-firs reach such great height). The leaves are flat, soft, linear, 2–4 centimetres (0.8–1.6 in) long, generally resembling those of the firs, occurring singly rather than in fascicles; they completely encircle the branches, which can be useful in recognizing the species. 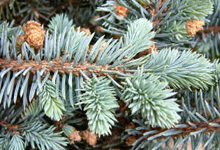 Blue Spruce, is a medium-sized evergreen tree growing to 25–30 m (82–98 ft) tall, exceptionally to 46 m (151 ft) tall, and with a trunk diameter of up to 1.5 m (4 ft 11 in). The bark is thin and gray, with narrow vertical furrows. The crown is conic in young trees, becoming cylindric in older trees. The shoots are stout, orange-brown, usually glabrous, and with prominent pulvini. The leaves are needle-like, 15–30 millimetres (0.59–1.2 in) long, stout, rhombic in cross-section, dull gray-green to bright glaucous blue (very variable from tree to tree in wild populations), with several lines of stomata; the tip is viciously sharp. Pine Trees are an evergreen coniferous tree growing up to 35 m in height and 1 m trunk diameter when mature, exceptionally to 45 m tall and 1.7 m trunk diameter and on very productive sites (in Estonia, there are some 220 year old trees that are 46 metres tall in the forests of Järvselja). The bark is thick, scaly dark grey-brown on the lower trunk, and thin, flaky and orange on the upper trunk and branches. The habit of the mature tree is distinctive due to its long, bare and straight trunk topped by a rounded or flat-topped mass of foliage. The lifespan is normally 150–300 years, with the oldest recorded specimens (in Sweden and Norway) just over 700 years. The shoots are light brown, with a spirally arranged scale-like pattern. 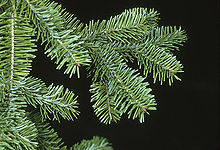 On mature trees the leaves (‘needles’) are a glaucous blue-green, often darker green to dark yellow-green in winter, 2.5–5 cm long and 1–2 mm broad, produced in fascicles of two with a persistent grey 5–10 mm basal sheath; on vigorous young trees the leaves can be twice as long, and occasionally occur in fascicles of three or four on the tips of strong shoots. Leaf persistence varies from two to four years in warmer climates, and up to nine years in subarctic regions. Seedlings up to one year old bear juvenile leaves; these are single (not in pairs), 2–3 cm long, flattened, with a serrated margin. Shasta Red Fir is a large evergreen tree typically up to 40–60 metres (130–150 ft) tall and 2 metres (6.6 ft) trunk diameter, rarely to 76.5 metres (251 ft) tall and 3 metres (9.8 ft) diameter, with a narrow conic crown. The bark on young trees is smooth, grey, and with resin blisters, becoming orange-red, rough and fissured on old trees. The leaves are needle-like, 2-3.5 cm long, glaucous blue-green above and below with strong stomatal bands, and an acute tip. They are arranged spirally on the shoot, but twisted slightly s-shaped to be upcurved above the shoot.